Ranting punk poet ATTILA THE STOCKBROKER has just released a new album with a difference. Restoration Tragedy sees Attila and his band BARNSTORMER 1649 creating an album fusing the music of the 17th Century with the sounds of ’77 buzzsaw punk, inspired by events just after the English Revolution, when Charles I was beheaded, the country became a republic, the ‘world turned upside down’ and unprecedented radical ideas spread across the land. This album of ‘Roundhead Renaissancecore’ features numerous early musical instruments, such as shawm, crumhorn, cornamuse, bombarde, shawm and five different recorders, jousting with guitar, bass and drums all played by Attila and the band themselves. 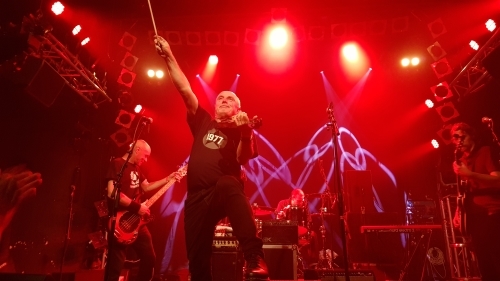 Attila The Stockbroker began performing as a poet in 1980 in Harlow, Essex alongside his mates NEWTOWN NEUROTICS. Since then he has toured widely, playing more than 3,000 gigs in 24 countries, including pioneering shows in East Germany and Albania. His acclaimed autobiography Arguments Yard (35 years of Ranting Verse and Thrash Mandola) was published by Cherry Red Books in 2015. Watch a full Barnstormer 1649 live show from Latest Musicbar, Brighton here.